This was my first kit I ever bought. 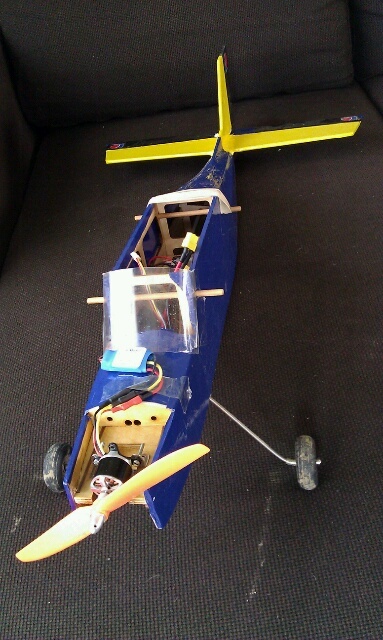 I tried to fly it once it was finished years ago. Hand launched it, flying directly into a fence... Since then I didn't have the time (nor courage) to get back to this hobby. Until recently when I started really learning to fly with cheap scratchbuilt foamies. So much more fun and no real issues when you dive into a fence for instance. In the beginning I even had several fuselages with me to the field in order to have at least some airtime :). Now that I can fly and even have experience with ailerons and warbirds I got back to this balsa kit. It was built already, I only needed some minor repairs and redo the covering. It still had a glow motor installed so I ordered a 2217-06 brushless motor to get it up without the noise and grease of a glow engine. I'm still no hero with oracover (well I don't have the right tools, just using a regular iron) so mine isn't looking as sweet as the one pictured on top here. The Colibri is a 1400mm wingspan, +/- 1000 gram trainer model. It comes with or without ailerons. I have the 3 channel version (RET) which I regret right now. I should have gone for the aileron version directly. It's known for it's easy built and nervous flying characteristics. Building was really easy with all the elements perfectly laser cut and numbered with clear instructions and full size plan. Landing gear (heavy one though), tank, control rods, servo tray and other hardware is included. It should be a trainer I know. The trick is to keep it as light as possible. Going electric helps. Some other weak points are the wing connection (reinforce with glassfiber) and the non steerable tail wheel (really need to replace that!). These are some pictures of my setup. 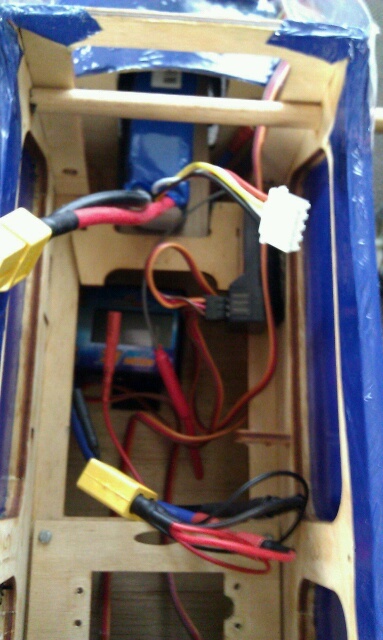 With a 3s 2200mah lipo installed where the gas tank used to be and the ESC up front it balances well. Total flight weight is 1190 gram. I could get it down a few grams replacing the heavy Graupner C508 standard servo's. Also the ESC I'm using is only rated for 25A which is just not enough. 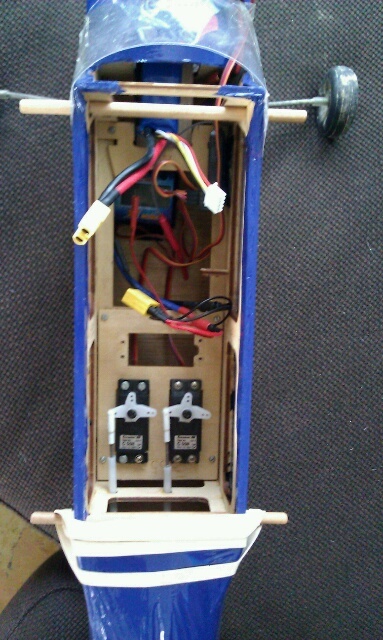 I have a watt meter installed in flight also as you can see in the pictures. 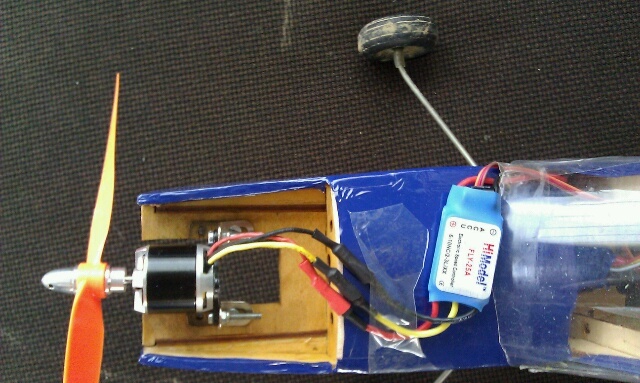 Here you can see how I used the mounting plate to secure the gas tank reversed in order to keep the battery in place. I also added a 3mm balsa sheet to support the battery. 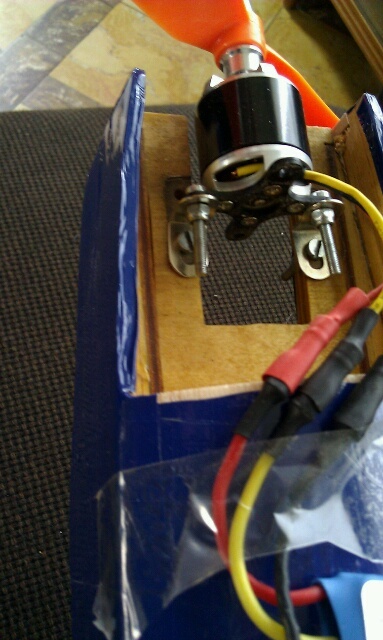 The motor is installed using the holes I already made for the gas motor, adding some L brackets. The ESC, only rated for 25A while full throttle with 9x5 prop is more towards 35 amps... I just don't throttle it all the way up. I went flying a few times now and indeed the take-off is a bit difficult due to the lack of a steerable tail wheel. When a bit more wind is available it takes of into the wind almost immediately. Without wind the runway is a bit harder due to the lack of a steering wheel. Also the control throws are quite heavy so some expo is desired. Once up in the air it flies very well. I can fly it with very little power, almost gliding. If I cut power completely I get a very predictable stall and glide down. This sure is a good beginner airplane. Too bad I don't have the ailerons. I had some hard failures during takeoff with the wing hitting the street. It was easily fixed and recovered. Still love the way you can repair balsa and cover up like you never crashed that plane :-). Great plane! How did you do the hinges by the way? I bought one and i'm having trouble. I used plastic hinges and then made a cut in the tail sections to slip the hinges in with some glue.